No one loves a green pool…if you loved one, you wouldn’t be on this page seeking out how to clean a green pool in 7 easy steps. Now that we have agreed that a green pool is something no one desires, let’s be clear about one thing: this article offers a no-nonsense (manual – not automatic or chemical) guide on how to easily clean an algae infested green colored po﻿﻿﻿ol. If this is what you desire at the moment and can’t wait to get back the clear sky-blue color that that your lovely pool once spotted, follow us down the page…we’re going to do thorough justice to this topic. 1 What Causes Swimming Pools to Turn Green? What Causes Swimming Pools to Turn Green? When your lovely (once clear sky blue) pool turns completely green, it is surely a great cause for worry. However, great chances are that you do not know what was/is responsible for the awkward change. Before we thus proceed directly, let’s see: what actually causes swimming pools to turn green? There are a variety of reasons. 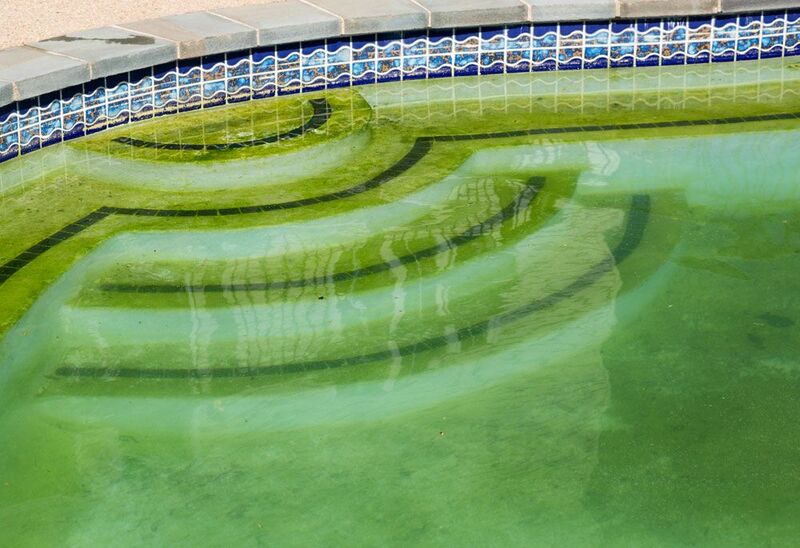 However, the major cause of a pool turning green is the growth and spread of algae, as a result of direct l﻿﻿ack of maintenance or clear abandonment. For the records thus, a pool that is properly maintained cannot simply turn green. Then again, greater chances are for a pool to turn completely green if it has not been maintained for some time. Accordingly thus, you need not bother about your pool turning green if it has not been abandoned and you properly maintain it. Let’s now see: how to get rid of pool algae? It is clear that a green pool is a bad idea. However, you may not know just how bad an idea it is and how it is important that you avoid this reality completely. The following documents how exactly a green pool is a really terrible idea. A green pool looks really terrible and does not portray you, the owner as a serious person, one who is clean or worse, one who maintains his/her things and is worth taking serious. This is certainly not the type of image you’ll love to project to the outside world. Water that is ﻿﻿infested with algae is VERY unhygienic and projects many health risks if accidentally ingested. Why would you bother with such a health risk seeing that it is completely avoidable? For those who have sensitive skins, water from a green pool may cause skin irritation or other major skin challenges such as rashes or irritation. While these are minor and would certainly go away with time, they cause serious discomfort and before they finally go away, ensure maximum irritation for those whom they afflict. Green pools are, in most cases, associated with horrible and unspeakable smell. This reality, besides rendering the pool completely unusable may also make the reality of sitting close to the pool (or staying near the pool surface) completely impractical. Why feel uncomfortable and be threatened with horrible smell right in your own house, your very sanctuary? Finally, a green pool, because of the algae infestation is generally slimy. A pool that is slimy does not make for an excellent swim even after the water is changed and the pool conditions improve. To overcome this challenge, you’ll need to completely clean up your swimming pool and importantly, follow the tips we have laid bare here. The steps outlined here are not mechanical (in nature) neither do they require advanced technical knowledge. Anyone who has used or owned a pool for a week (or if you’re a fast learner, 3 days) should be able to carry out these simple restoration tasks. The primary cause of a green pool is dirt – characterized chiefly by algae infestation. If you have a case of a green swimming pool on your hands, the first thing that should come to your mind is to get rid of the primary cause of the green color – the algae. …bring out your pool vacuum cleaner and set it to work. Depending on the model, the size of the pool and how dirty/infested with algae it is overall, this may take roughly between 12 and 48 hours. Be thus very patient while the vacuum cleaner does its job. Be sure to deploy a model that possess enough suction to draw out stones and other unwanted debris that may have contributed to the overall discoloration of the pool. Also, be careful and cautious enough to pick on a model that will vacuum not only the floor of the pool but will also work on the walls, the steps and more importantly, the hard to reach crevices and sharp angles. Once this process is completed, the swimming pool will be at least twice as green/dirty as it initially was…if you do not notice any remarkable ‘improvement’ in the green color or general dirt, it means that the suction pool ﻿﻿vacuum cleaner did not do a thorough job…send it back in or better still, consider getting a better, more powerful model. This is a very simple step and should not pose any problem. Right after draining the dirty water (that your vacuum cleaner had earlier on worked on), kindly drain the entire pool. Usually, this would be done via the central drain plug. However, you may elect to go the machine pump way – if this would prove faster for you. Right after the pool’s water is completely drained, it is time to jump right in the pool and manually scrub off any dirt/algae that the vacuum missed. Be warned though – depending on the size of the pool, this may take several hours and you may need help, depending on your physical strength/ability and the available time on your hands. After your initial cleaning stint, your swimming pool will be about 70% clean. However, this does not mean you should be satisfied or should relax because you’ve achieved relative cleanness. Remember, the goal is to have clean, clear sky blue water and not some passively clean pool water. To get to this objective, kindly refill the pool to half capacity and add chlorine – the measure which will be according to the pool size and the volume of the water in it at the moment. Once the addition of chlorine is effected, kindly leave the swimming pool unattended to for 24 hours. After 24 hours, add algaecide and leave for another 12 hours (or according to the instructions). When this time elapses, kindly drain the entire (dirty) water completely and hop right to item 4. The next logical step/procedure is to refill your swimming pool to your desired capacity – as you love to have it and actually enjoy it.The water from the refill is going to be quite clear at this moment and depending on your water source, may begin to reflect the almighty blue color that you so cherish. At this point, you can and should take a rest – and smile at your accomplishment. The worst is over and the joy of a clean pool has only just begun! After getting up from your rest and smiling at your achievement, you should add chlorine to the pool (in very reasonable and modest quantity). Aside chlorine, it will be a smart option to also treat the pool as per the general water/environmental conditions that are suitable for both your pool and the area it is situated. At this point, you can get your swimming suit and take a long dive in the water. After all the effort expended in cleaning the pool, isn’t it only logical that you should be the very first person to experience the result of your hard work? Well, after testing the pool and certifying practically that is now to your taste, you need to put something in place: a ﻿dedicated ﻿pool vacuum cleaner. This cleaner will work itself round the clock to make certain that algae do not make its home in your pool again. Importantly, a pool cleaner will ensure that the sky blue color of your pool is preserved and the sad greenish color banished from your pool borders forever! This point is very important but sadly, always overlooked. However, if you pay close attention to this point, you’ll save yourself the stress of bothering with manual cleaning efforts or worse, dealing with green algae determined to ruin your life and make it both work-filled and frustrated with (manual) swimming pool cleaning. Slim, algae, dirt, filth and all manner of undesirable pool elements have a field day in your pool when you do not properly clean it up but importantly, when you refuse to keep the water therein fresh. To enjoy your pool to the maximum, swimming pool water should be changed every four weeks. With this amount of ‘freshness’, it will always be akin to using the bathtub of your traditional bathroom when you land in your pool at the end of a hard working day or during the weekends. However, if conditions do not permit or you out-rightly cannot afford it, then, twice a year is a great idea. However, never allow pool water to remain unchanged for a whole year, irrespective of how well maintained you imagine your pool actually is. The major cause of a green pool is algae – and algae gets in your pool from either lack of maintenance or when you abandon your pool completely. Sadly, a green pool has many challenges that no one would normally wish on even his/her worst enemy. This article details exactly how you can overcome the reality of a very dirty (green) pool and achieve the freshness of a clean, fresh, sky blue pool. If you have any challenges executing these steps or need further clarification, be sure to simply leave a comment below…usually, we’re glad to help our readers with their challenges and respond to each comment directly – no matter how busy we may be. Enjoy your sky blue swimming pool!